Craig Barritt / Stringer/Getty ImagesJustin Bieber and Selena Gomez in 2011. Justin Bieber and Selena Gomez were recently spotted spending a Sunday together, and attending a church service. Bieber and Gomez both attend the mega-church Hillsong. Hillsong is a fairly conservative Pentecostal church that retains a very hip aesthetic and appeals to many celebrities. 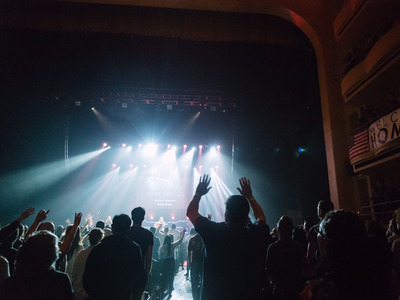 I attended a service at Hillsong’s New York City chapter to see what it was like. Shortly after Selena Gomez and The Weeknd (Abel Tesfaye) broke up, TMZ reported that Gomez and Justin Bieber spent the day together last Sunday. The pair reportedly grabbed breakfast and attended a church service together — sparking rumours that they’re back together. Bieber and Gomez are both congregants of the mega-church Hillsong, and reportedly used to frequent church services there when they were together. According to The Daily Beast, Bieber is known for bringing his love interests to services at Hillsong, making Bieber and Gomez’s recent appearance at the church intriguing. Hillsong, the mega-church that has been serving as the backdrop for Bieber and Gomez’s possible rekindling, is worth paying attention to. It has chapters all around the world, and is known for its casual, concert-like approach to traditional church services. 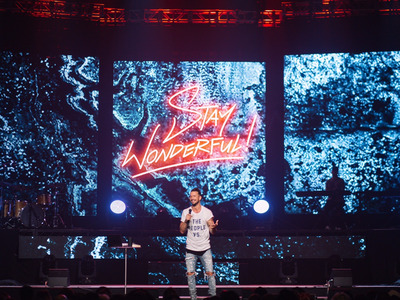 Hillsong’s NYC Pastor Carl Lentz told Business Insider that despite the church’s celebrity following, Hillsong is just a “normal” church. And although Hillsong puts forth a savvy rebranding of Christianity, it is, at its heart, a conservative Pentecostal church. Hillsong has openly opposed gay relationships and abortion in the past, and used to refer its members “struggling” with their sexuality to conversion therapy, according to The Daily Beast. While Hillsong stopped referring congregants to conversion therapy in 2011, some gay congregants have continued to feel unwelcome at the church. 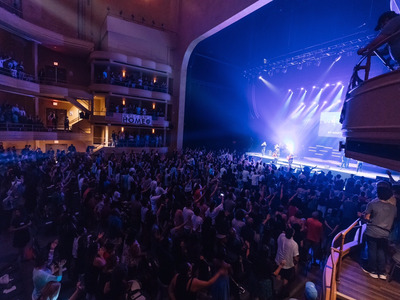 Curious, I went to see what one of Hillsong’s services was like, and attended a Sunday service at its NYC location. There were four different services to choose from on Sunday: 10 a.m., 12:30 p.m., 5 p.m., and 7 p.m. -- I opted to attend the 12:30 p.m. service. The long line to get into the theatre, and the casual dress of the churchgoers, confused me upon arrival. I could not believe I was walking into a church service and not a concert. 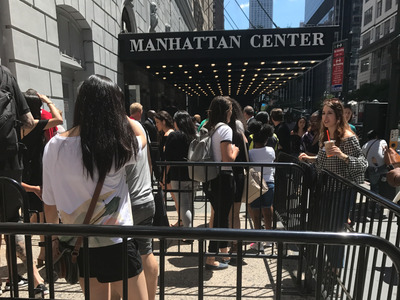 I had to ask the volunteers shepherding people into the building several times if I was at the right place, to which a friendly 'Yup!' and a 'Welcome!' followed every time. On entering the theatre itself, I was again taken aback by how concert-like the church was. It was honestly very impressive. The church band was in the midst of performing a song when I entered the theatre. The band looked and sounded like a pop band you might see at Panorama, or Coachella -- only they were singing about God. 'I think the bigger picture of our church is just normal, faithful people who love Jesus, who want to help others with their lives. And sometimes they happen to be famous,' Pastor Lentz told Business Insider. 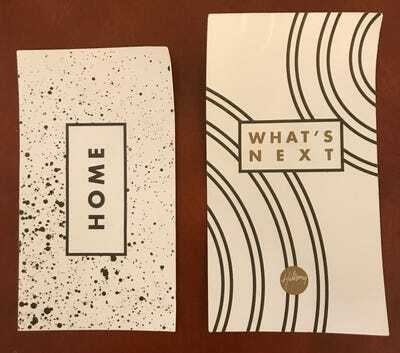 A pamphlet about the post-church services, and an envelope for donations labelled 'HOME,' were placed on the arm rest of every seat. 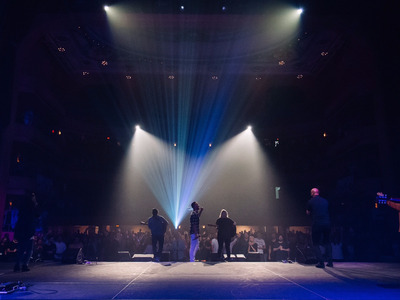 The theatre filled to its maximum capacity quickly, and after a couple passion-filled Christian-pop performances from the band, the service began. One person asked that the church pray for them while they mourn the loss of a wife, another asked for prayers to help them overcome cancer, and one person asked the church to pray that they got through their unexpected pregnancy -- to which Pastor Kane said he hoped they found a miracle. Pastor Kane then introduced Pastor Chris on stage to say a few words before getting back into the service. Pastor Chris gave a short sermon about the power of giving to incentivise the audience to donate, and reminded us of the many ways we could donate (cash, check, app, online, etc.). Pastor Nathan broke heaven down in a relatable way, going over all the 'cool' stuff that laid in store for us in heaven. Pastor Nathan was pithy and quick-witted, and I was surprised at how heartily I found myself laughing throughout his sermon. He spoke about being better versions of ourselves on a better version of earth, but 0ne thing that struck me as odd was the emphasis on material goods available in heaven. Hillsong's free Bible, 'Word,' doesn't read like a typical bible. 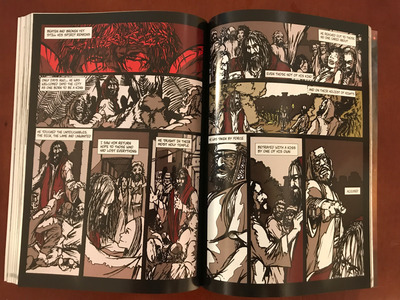 Hillsong's Bible, 'Word,' looks more like a graphic novel combined with an Anthropologie catalogue than a traditional Bible.